Yay half teh week is over!!! Weekend is only two days down the line. Do you have any plans over the weekend?? I for one am trying out Russian salad and Sev Puri recipe for the first time at home. Would share with you all how it turned out!!! Coming now to the nails of the week. 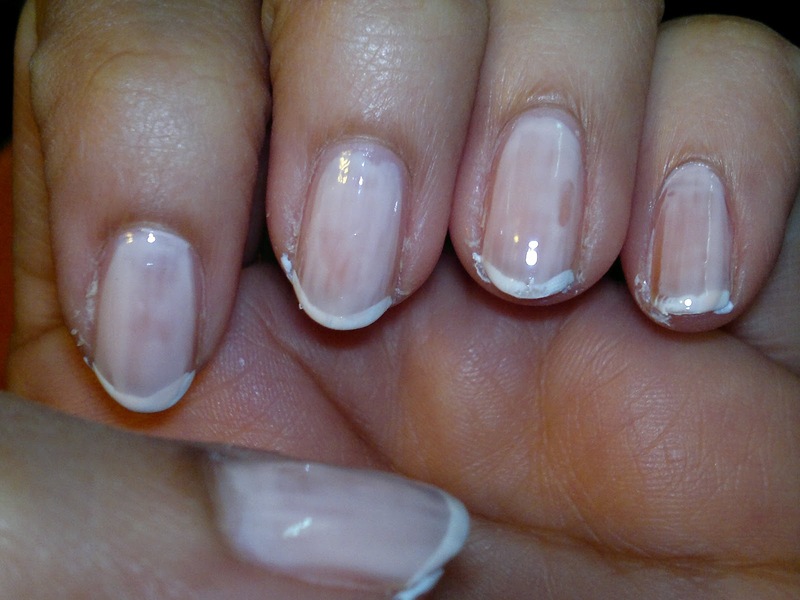 This week I decided to do a French manicure. I have been fascinated by this concept since my college days, but couldn’t figure out the big deal about it. Mostly people suggested that this was for making your nails stringer, and since I had preety tough nails, I thought that it was not for me. Until recently, my nails started showing signs of brittleness. So, last month I went searching for a French manicure kit. 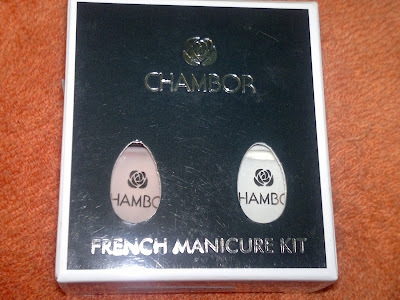 Though a lot of such kits are available, I got myself one such kit from Chambor. 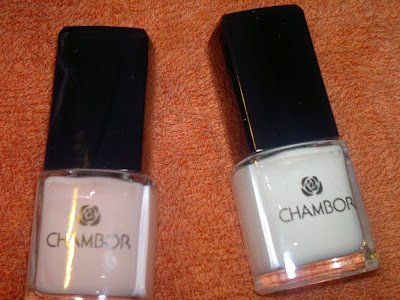 Price: INR 425 for two nail paints (one sheer called french rose and one for white tip called white rose) and 12 nail guides. The quantity provided would last me for at least 20 manicures, so I would say that it is a good deal to invest in a kit yourself once you get a hang of it. The packaging is very cute with small square bottles embossed with the French Rose. Both the nail paints dry quickly giving your nails a polished look in no time. 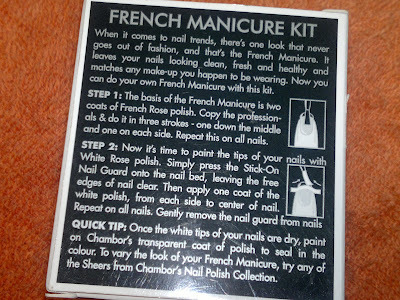 According to the instructions provided, you apply the white tip first and then layer the sheer color on your nails. The sheer color nail paint doesnot have very good brush and applies streaky on my nails. Here, I have applied two coats to get an even application and still you can see how patchy it turns out. The white tip should have had a thinner brush as the brush provided doesnot let you paint the tips evenly. This is the first time I have done a French manicure on myself and even though it doesnot look very neat, I am liking the French manicure. My nails and hands suddenly look cared for and put together. Am loving looking at my hands now. 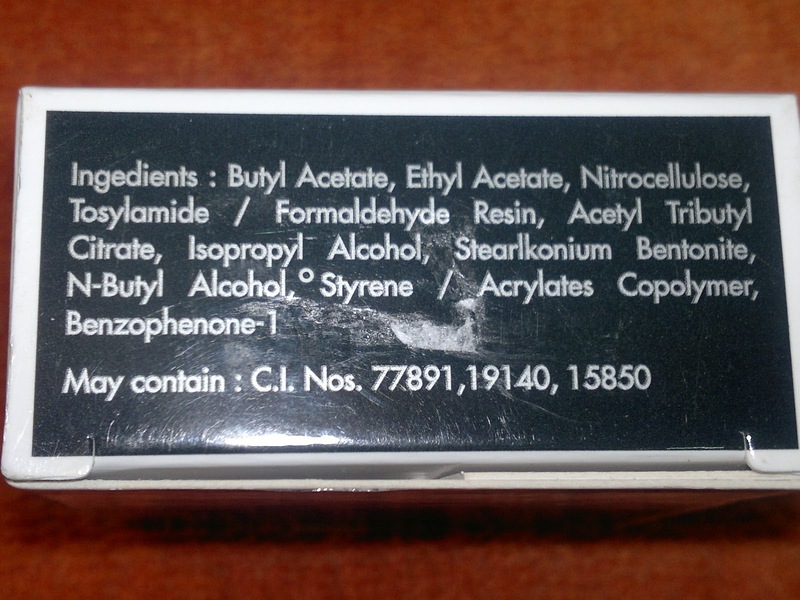 The nail paints are quiet long lasting and since this gives your nails a natural flush of health, you don’t even notice the chipping. Also, I have noticed that as long as the manicure is on my nails, they are less brittle. The nail paints are of good quality and don’t leave a stain on my nails. 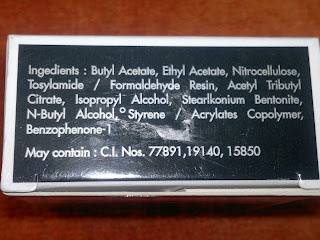 Product rating: B. Available at all Chambor counters, wouldnot recommend it even though it gives you a lot of applications for the amount spent. I will try a new French manicure kit once I master the art, and once this runs out, which is going to happen in a long, long time, I guess!! !